The recording of Magnus Lindberg's Clarinet Concerto (ODE 1038-2) has been continuously garnering top reviews in the international press. 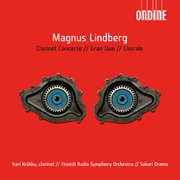 The all-Lindberg CD also contains Gran Duo for winds and brass, as well as Chorale. Sakari Oramo conducts the Finnish Radio Symphony Orchestra, joined by clarinet soloist Kari Kriikku in the Concerto. Lindberg's Clarinet Concerto was commissioned by the Finnish Broadcasting Company (YLE) on the occasion of its 75th anniversary. Le Monde de la Musique has chosen the Lindberg CD as one of the 20 best CDs of the year 2005 ('Choc de l'année 2005'). Reviewer Patrick Szersnovicz writes: "The works compiled on this disc bring to light the intensity of Magnus Lindberg's music. The excellent clarinetist Kari Kriikku, remarkably accompanied by Sakari Oramo and the Finnish Radio Symphony Orchestra, shows a breathtaking facility when playing with the challenges of this magnificent music." Gramophone's October issue features the Lindberg CD as one of the monthly 'Editor's Choice' CDs. Reviewer Guy Rickards writes: "Here's a wonderful trio of pieces by one of Finland's finest contemporary composers. The Clarinet Concerto (2000), written for and played by Kari Kriikku is a single-movement work that draws on the sound of the solo instrument creating different levels of intensity and texture. The language is modern without being abrasive and the performance couldn't be bettered." The French Classica-Repertoire magazine presented the Lindberg CD as one of the 'Evénements CD' in December/January and granted it a 'R10' rating. Reviewer Stéphan Vincent-Lancrin calls the recorded Clarinet Concerto a "total masterpiece" that is "served by the sumptuous and inspired clarinet performance of Kari Kriiku". The CD release leads him to conclude that "maybe contemporary music is not in such a bad shape..."
ClassicsToday.com selected the recording as 'Disc of the Month' in November, in addition to a 10/10 rating: "There are also gems like this one, waiting to be discovered, proving conclusively that Classical Music is not dead, and may even (perish the thought) be thriving. Certainly this is the case in Finland, where clarinetist Kari Kriikku has inspired a number of fine works. Indeed, 2005 may just be 'the year of the Finnish clarinet concerto' ". Reviewer David Hurwitz calls Magnus Lindberg's Clarinet Concerto "just fabulous, perhaps the finest work he has written, and certainly one of the tiny handful of truly great pieces in the medium", and writes about its performance: "There's so much variety and ear-catching contrast, and this performance is so magical in its freedom of expression and effortless virtuosity, that it wouldn't surprise me if you played the work straight through twice at a sitting. It's that good." The Financial Times chose the Lindberg CD as one of the 'Best Classical CDs and DVDs of 2005', and on December 16, The New York Times listed the Lindberg CD amongst their selection of the year's most notable CDs. The Guardian featured the Lindberg CD as 'Classical CD of the week' in September. The review by Andrew Clements was headlined "All that glitters is gold". Clements writes: "Lindberg's Clarinet Concerto is that rare thing, a piece written by one of the leading European composers of our time that manages to be unfailingly approachable and rewarding without making any compromises in its musical language or technique." Clements praises the soloist Kari Kriikku as "astounding" and writes that "These moments are woven into an instrumental fabric that is so richly coloured, so packed with incident and instantly memorable musical ideas and so logically put together that the ear absorbs everything without hesitation, and when the work has ended immediately wants to experience it all again." On BBC Radio 3, the recording was also presented in December as one of the 'CD Review Critics' Choices 2005', and it was simultaneously elected as one of the 'Listeners' Discs of the Year 2005'. Works like the concert-opener Feria (1997), large-scale orchestral statements such as Fresco (1997) and Cantigas (1999), and concertos for cello (1999) and fo clarinet (2002) have established Magnus Lindberg as one of the most invigorating composers in the orchestral field.